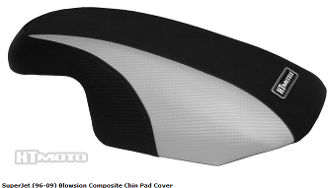 HT Premier custom PWC chin pad covers for Blowsion Composite Chin Pads provide the best in looks and performance. You choose the material and color for each panel on the cover. You can even choose the thread color. (shown in Black Gripper, Silver Carbon Fiber and Black Carbon Fiber with Black stitching) Each cover is custom made to order. There are no refunds or exchanges. *CALL TO ORDER YOUR CUSTOM CHIN PAD COVER TODAY.